Endobronchial cryotherapy is one of multiple bronchoscopic modalities that can be performed using rigid or flexible bronchoscopes. It is used primarily in the treatment of benign and malignant central airway obstruction, where cold energy has destructive effects on the local microcirculation as well as at the cellular level, and repeated freeze-thaw cycles result in sloughing of tissue relieving the obstruction. Cryotherapy is also used for obtaining adequate endobronchial and transbronchial lung biopsies with an excellent safety profile. 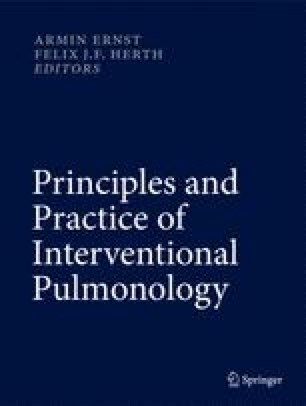 This chapter discusses the scientific basis of cryotherapy, procedural techniques, and the clinical evidence behind this practice. I would like to gratefully acknowledge Dr. Adnan Majid for his helpful contributions and enormous support during the process of writing this manuscript.